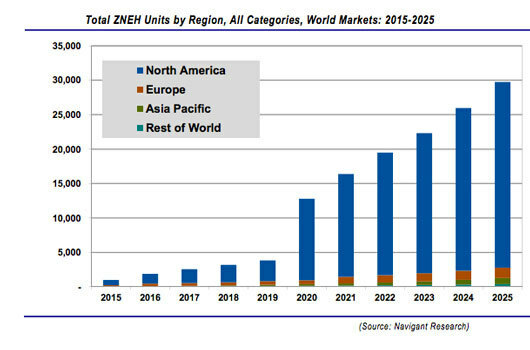 According to a new report from Navigant Research, North America is leading the zero net energy home (ZNEH) market, with builds expected to grow from 750 in 2015 and hit 27,000 in 2025. The report, titled Market Data: Zero Net Energy Homes, examines the global market for ZNEHs, near-ZNE, and ZNE-ready, and points to the increase on energy efficiency in building codes and the use of onsite generation for grid load management as the main drivers of growth. “ZNEHs are still quite rare, however, the market is poised for growth over the next decade, particularly in California, where a strong regulatory framework calls for all new homes to be zero net starting in 2020,” Strother explained. California is leading the charge toward ZNEHs worldwide, the report notes, with other states and countries in select regions starting to follow suit. The market is also expected to pick up respectively in Asia Pacific and Europe. Total units in the Asia pacific region are expected to reach 900 and 1,500 in Europe by 2025. Similar to California, a 2010 European Union directive requires all new buildings be near-ZNE by the end of 2020. For more information, visit the Navigant Research website.